These stories capture the process of rediscovery that is the essence and the adventure of living and growing. They explore the ways people find the strength to plunge back into life after pain and trauma. 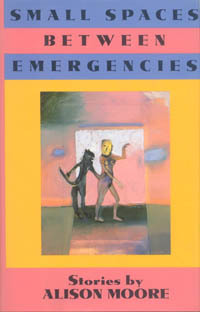 "Small Spaces between Emergencies is an elegant book of love and loss. The stories are beautifully crafted and exquisitely rendered. Alison Moore is an exciting new voice." "The women and men in Alison Moore's stories are on the run or on the road,and they often arrive at what first appears to be a dead end, the last place on earth. But these stories of flight-and-arrival contain messages of trust and wisdom - there is often a teacher in them somewhere - and in their gracefulness, their ability to go with the drift of things, they have a quality that is distinctly their own. Alison Moore's debut collection is sensual and wise, and she writes like an angel."